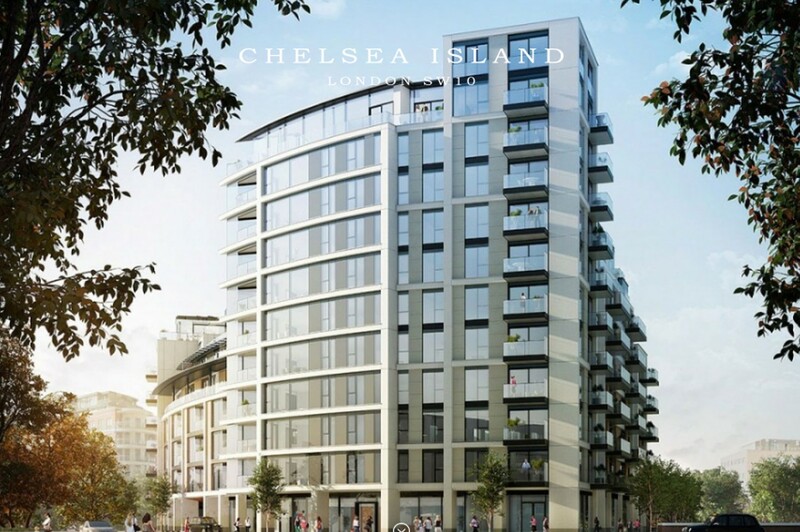 Chelsea Island is a high end residential development overlooking Chelsea Harbour, consisting of 3 cores with 12, 8 and 6 storeys and commercial units on ground floor. Chelsea Island Development, SW10 London. MGF were approached by Quinn Construction to design the temporary basement propping during the construction of the single storey sheet piled basement. This propping scheme would eventually be handed over to Midgard of the JRL group upon completion of the bulk excavation. The excavation was locally deeper in the south west corner of the basement where 18.00m long sheet piles were utilised. 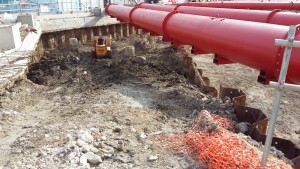 Due to the presence of London Underground and delayed diversion of UKPN cables, the scheme had to be phased so as not to interfere with the reinforced concrete substructure or the removal of the cables. 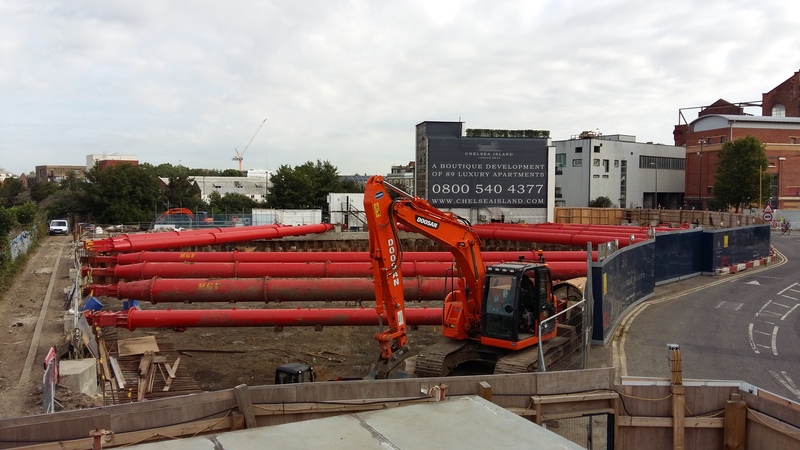 For MGF Engineers, this was particularly challenging for two reasons 1) Raking props could only be utilised following the installation of the core cap and 2) The main line network rail viaduct runs alongside the site and the allowable ground movement was <15mm. These factors combined with a complex geometry, breaks in the capping beam and satisfying the needs our customer and the ground movement specialist (Byrne Looby) the engineering and coordination was challenging. The London based MGF team, provided a risk managed, professionally engineered temporary works solution which consisted of; 16No 2500kN hydraulic props with almost 300m of 1000 series to RC Corbels above the capping beam. This solution enabled the ground floor slab and north core to be constructed unimpeded. The final prop should be removed in December 2016.